For one century bacteriophages, viruses of bacteria, have served and continue to serve as a basic model for understanding the fundamental principles of life. Indeed, research on bacteriophages is inseparable from the emergence of the field of molecular biology and led to major discoveries, from the identification of DNA as the genetic material and all the way to the discovery of the CRISPR-Cas systems which recently revolutionized many disciplines in life sciences. The year 2017 marks the 100th anniversary of the initiation of bacteriophage research by Félix d’Herelle at Institut Pasteur. 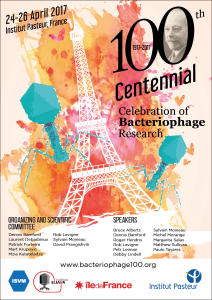 To celebrate this occasion, Institut Pasteur, in collaboration with Eliava Institute, is organizing a special conference in its historic location – the “cradle” of bacteriophages. The event aims at providing a broad overview of the major milestones in the bacteriophage research and will cover recent advances in bacteriophage-host interactions, bacteriophage ecology, the evolutionary heritage of bacteriophages as well as their therapeutic, biotechnological and industrial applications. This conference is endorsed by the International Society for Viruses of Microbes (www.isvm.org).